For being such a gifted musician, Andrew Bird is also remarkably versatile. 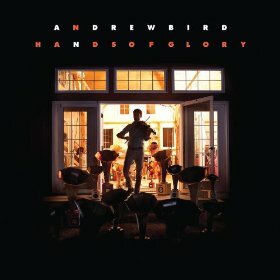 Earlier this year, he released Break It Yourself, a record where Bird’s instrument of choice leaned more toward violin. On Hands of Glory, the companion EP, Bird has gone full fiddle. A combination of original tracks and reimagined covers, Bird balances on the barrier between folk and country to brilliant result. Opener “Three White Horses” has all the lonely lyrics and dirty, wailing strings that one would expect from the songs that have become country classics, and it ties well with the hypnotic, sprawling “Beyond the Valley of the Three White Horses.” Between these bookends, a vocal performance and an instrumental showcase, Bird covers dusty ground with a distinctly indie air. With distorted vocals, Bird takes on The Handsome Family’s “When That Helicopter Comes,” while the fiddle comes to the forefront in his minimalistic cover of Townes Van Zandt’s “If I Needed You.” “Railroad Bill” is territory that has been oft traveled but the brushed drums, delicate guitar, and twangy vocals are all spot on. Bird’s contributions likewise fit right in. “Something Biblical” is rich with metaphor, as the title indicates, and the fiddling is appropriately subdued. “Orpheo” is a reworking of “Orpheo Looks Back” from Break It Yourself. The original album version is faster and flashier, but “Orpheo” is stripped back to mournful fiddle and quiet verse. The only complaint I have about Hands of Glory is that I wish it were longer. The old country and folk side that Bird displays here is worth exploring further, and hopefully he will continue such dabbling in the future.